TODAY IS THE 64th anniversary of the Volkswagen Type 2, let today discuss one the best variant of the VW bus. This the most strongest and reliable microbus ever made in the world... exaggerated..? OK, let's reduce its scope... it's absolute true words of an automobile ever produced by Volkswagen. So what is special about..? The Volkswagen Syncro Transporter is all terrain vehicle based on third generation Volkswagen Type 2, they come with 4x4 drivetrain also is the third four-wheel drive vehicles ever developed by Volkswagen with seriously and certainly after Kommandeurwagen and Schwimmwagen, both are the light military vehicles during World War II. The statement above probably right, the Syncro is one of the strongest and most versatile vehicles every produced, made to able the military used and can be owned by civilians for fun. Not doubt it's the BEST VW Transporter ever made. Awesome capture, is an ultimate adventure microbus the Volkswagen 4x4 Syncro 16" are run to chasing time at Offroad rally competition. Over 40 years after the war end, Volkswagen decided to modernize they have 4WD system technologies. 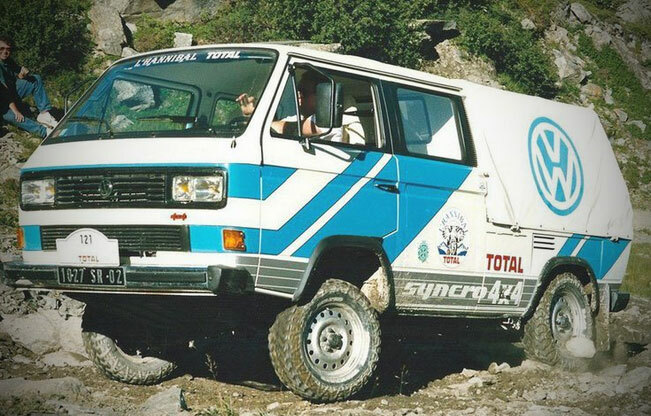 The reason is when a couple of VW engineers want to camping far away from mainstream regions in Africa & Europe for something a little more rugged and off-road adventures desired where their Westfalia camper can't do it, then they decide to created the VW Syncro. Basically the Syncro 4WD system developed from the Ferguson system its invented by a Briton where is commonly used on Jensen cars and succeed well tested on the racetracks. Besides own used the Volkswagen took this system for the Puch Haflinger it's an military vehicle produced by Austrian company Steyr-Daimler-Puch. Since 1975 before the Ferguson system used for final basic, the Volkswagen has done a lot of trial and extensive testing its own system and or with Audi Quattro system. And the result of development with the Quattro system applied on Iltis where they used for German Armed Forces vehicles. Start from 1985 finally at 1992, all the Syncros assembly in Graz, Austria concurrently with Steyr-Daimler-Puch, the first Volkswagen Syncro hit on the market in 1986 comes with 3 engine formats available in 3 body styles and not to miss the camper and RV model also. They solved the crowd... no... they make it. 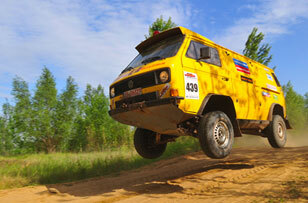 The Syncro is automatic 4x4 drivetrain system, are is different system with usually other 4WD vehicles use. The Synchro has silicone liquid to make 4x4 get it work, so when you driving in normal roads you'll feel same as usually RWD car work, but when through a rough or slippery roads without the intervention you'll get 4WD. How it works, when get in rugged or slippery terrain the viscous coupling (a Synchro special gearbox) getting work harder with more often torque or at any time the rear wheels began to slip or spin the silicone liquid automatically engage and respond, he started hot and begins thicken then deliver pulling power to the front wheels so it make 4x4 has work. The viscous coupling has 4 gears plus "G", the G is a very low ratio gear that was very useful for goes to Off-Road Playgrounds or down extreme slopes. To remember, when you feel 4x4 doesn't work, please check silicone liquid condition, it same as lubricant engine is need renewed when has expired or exhausted. We hope this article can be useful for some prospective enthusiasm.